As you start to make money on your blog or website, you will start to see words like CPM, CPC, CPA & Optimization. Understanding these words and other online advertising vocabularies can be quite overwhelming but necessary to ensure you maximize your money making potential. First, let’s look at the different ways in which advertisers purchase display banners (Remember that display ads are the most popular methods in which advertisers promote their brands). The most common unit of measurement for display ad purchases is on a CPM basis. CPM stands for cost-per-mille or cost-per-thousand. A CPM rate is the cost the advertiser pays for 1,000 impressions. There are several factors that can determine the value of an ad unit such as the placement of the ad on a site, the level of detail included in the ad targeting, and how valuable your audience segment is to the advertiser. Essentially the more align your audience is with the advertiser’s target market, the more interested they will be in advertising on your site. And advertisers will continue working with you if your audience continues to engage with their brands. At BrideClick, we specialize in all things weddings and bridal. By joining our network, we place bridal and wedding ads that perform on your site versus general advertisings that may not work, therefore lowering your CPM. There are other paid advertisements for display ads such as CPC (cost-per-click), CPA (cost-per-action) and CPL (cost-per-lead). These measurements can be trickier to deliver on because your audience needs to take some sort of action before the advertiser will pay you. BrideClick does not recommend incorporating too many CPA/CPL/CPC onto your website since it lowers the publisher’s advertisement performance. The majority of advertisers have very sophisticated tracking metrics available so they can evaluate if that click-through to their site led to a sale (CPC evaluation) or if that user who signed up for their newsletter from the banner is actually a bride (CPA/CPL evaluation). If an advertisers sees a lot of traction from your blog, they may continue to spend to advertise on you site on a CPC, CPA or CPL level. However, if there is not enough volume, they will discontinue. 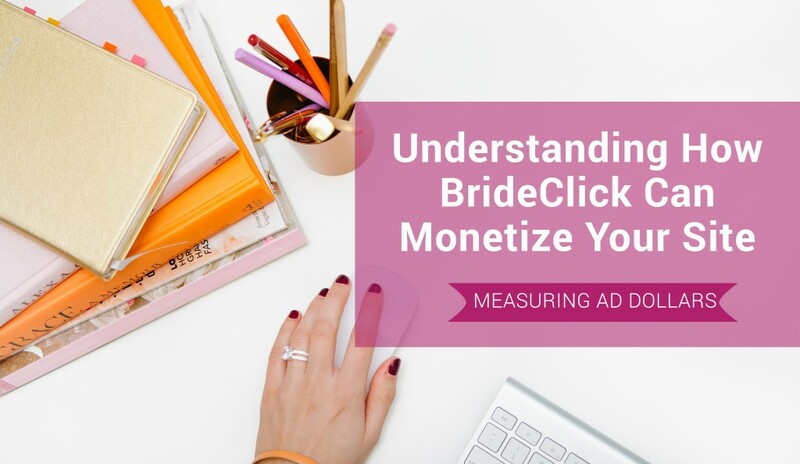 By working with BrideClick, you’ll have a team who helps you determine your audience engagement with advertisers’ display ads so that we can optimize and show more ads from campaigns that are resonating with your readers. In doing so, we can help advertisers see the value in working with you as a network partner. When advertisers measure campaigns based on a CPM model, they compare your CTR %, or click-through rate, across all display advertising channels. CTR is calculated by measuring the rate at which your audience clicks on an ad. The CPM basis is the best measurement for you as a blogger because you are getting compensated for creating brand awareness (promoting the banners to your audience) as well as for any conversions that you create for that advertiser. With CPC, CPA and CPL campaigns, you will not be guaranteed revenue. In the next post of this series, we will discuss how to get the most out of the display ad options available with some information on different types of ad units and the best way to set up your blog. For more information about joining our wedding advertising network, please contact us at [email protected] or sign up here.